His name in his native Bangla means ‘dawn’ and he certainly heralds as the new dawn in the Shahjahanpur Gharana of Sarod. Born in Calcutta, this young Sarodia was raised in a rich musical environment. His parents were great connoisseurs of music and he was exposed to the very best of Indian classical music and other forms of world music from his early childhood. He was initiated into Sarod at the tender age of eight by Pandit Samarendra Nath Sikdar, an eminent disciple of Pandit Radhika Mohan Maitra. After a few years of initial training he started learning from the celebrated Sarod maestro, Pandit Buddhadev Dasgupta and continues his training till this day. Prattyush brings to his music not only the rich tradition of his Gharana but also distinctive elements of vocal and other instrumental music of northern India. His playing represents good technique and his own unique style, which has evolved through experimentation by blending the old with the new. He was one of the first to successfully reproduce the Tappa style of north Indian classical singing on the Sarod. Like the legends in his Gharana he has also experimented with the Sarod and produced the first electronic version of this instrument which he has named as Jyoti Dhwani (meaning the sound of light). In addition to his training under Pt. Dasgupta, Prattyush has also studied vocal music, tabla and piano. He is a good composer and music arranger. He has been performing regularly in public since he was eleven and has played in quite a few major music festivals throughout India, in addition to being regularly featured on radio and television. He recently concluded a couple of successful music tours to Europe and has released his first solo CD album. 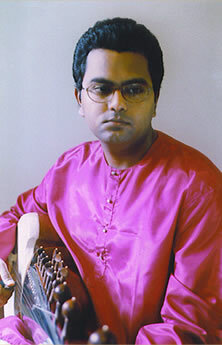 In this audio clip, Prattyush plays a Tappa style composition in Raga Kafi.